Enjoy the full Turf Valley experience with a round of golf. 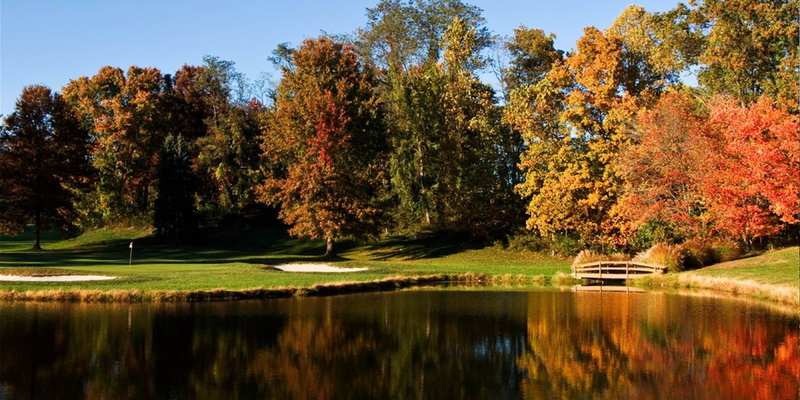 Turf Valley features 36 holes of championship golf along with some of the most beautiful scenery Maryland has to offer. Against the backdrop of Ellicott City's rolling hills, Turf Valley's two courses, the Original and the Hialeah, provide striking contrasts in design and promise to challenge every aspect of your game. Located just 20 miles outside of Baltimore, Maryland and 35 minutes from Washington DC, Turf Valley is the perfect resort getaway for group golf events. With two very distinct courses, your event can be as simple or sophisticated as you choose. The Original Course is the more traditional of Turf Valley's two 18-hole golf courses, while the Hialeah Course, considered a shot-maker's course, winds its way through the woods and over hills. Please call 410-465-1504 for current rates. Call 410-465-1504 for rates and tee times. Contact Turf Valley Resort at 410-465-1504 for more information and details on holding a golf outing at the course. Our 172 guestrooms, including 70 suites, have been recently renovated to better serve the needs of our guests. Each room is equipped with amenities like Keurig coffee makers and complimentary Wi-Fi. Explore our varied room types below. Each has something unique to offer. Contact Turf Valley Resort at 410-465-1504 for onsite or nearby dining options. This profile was last updated on 03/08/2017 and has been viewed 6,199 times.